Dramatic and mysteriously affecting, Kyla’s art is one that matches an evocative romanticism with an unmistakable sense of wonder. 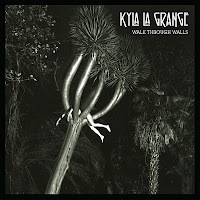 This introductory debut single swoops and soars, and is completely owned by Kyla’s powerful larynx. It sounds nocturnal, alive and urgent. Growing up in Watford and born of a Zimbabwean father and a South African mother, Kyla started to play music at the age of five, and has been forming and folding garage bands since her early teens. As a philosophy student, Kyla quickly discovered the importance and freedom of lyricism, but it was the art of songwriting that spoke to her loudest. Her early live shows at the Communion nights in Notting Hill demonstrated an artist with a sense of flamboyance, and an almost innate sense of melody. Performing with a band, a very important part of both this artist’s make-up and her smoky sound, Kyla’s songs rely upon a strong dynamic that is found within a full electric group. Having already spent time in the studio with Faithless’ Rollo Armstrong, and then the Communion crew, it wasn’t until she hit the road on a number of high-profile support slots in 2010 that Kyla realized what she wanted to achieve with her recordings. The live show was huge, and the recordings needed to reflect that. Unrestrained but never out of control, raw but never over-complicated, ‘Walk Through Walls’ and ‘Courage’ demonstrate a woman with a focus focused on the surreal, and the otherworldly. It’s untainted and it’s quite magical. Kyla will perform at SXSW in Austin, Texas in March 2011. Her UK shows will be announced shortly.